​Spring is upon us again! The early blooming plants are starting to flower. And that makes me want to paint. 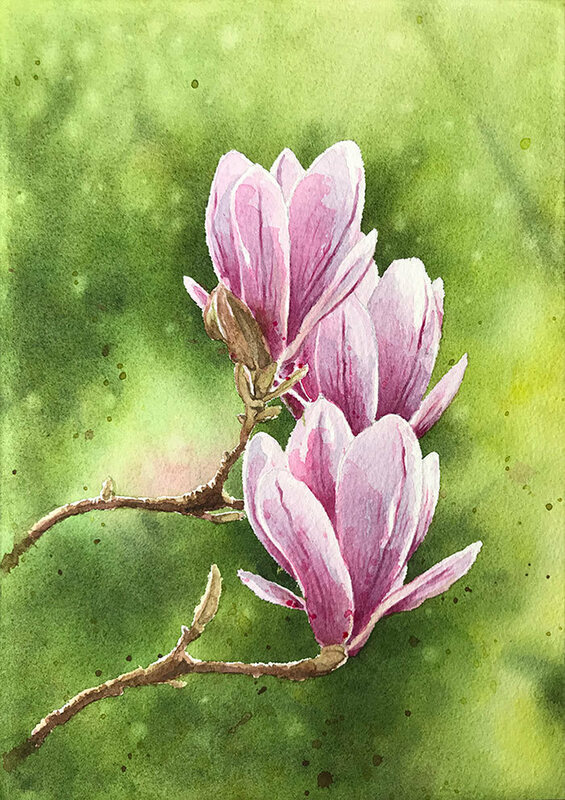 One of my favorite springtime blooms is the magnolia. Eventually, I’m going to plant one in my garden. But for now, I thought I’d show you one way to portray these beautiful flowers in watercolor. Stretching and masking are both time consuming processes. It might seem frustrating to spend time preparing your surface before painting, but believe me, it’ll be worth it! 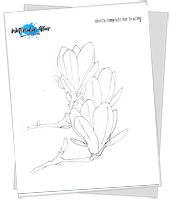 ​If you'd like to follow along and paint this yourself, you can download my sketch template so you can trace the outlines of the flowers onto watercolor paper. Because I’m using a wet in wet technique for the background I decided to stretch my paper beforehand. When you use a lot of water it’s inevitable that the paper begins to warp and buckle (yes… even watercolor paper buckles when soaked). This makes the paint more difficult to control because wet paint will fall into the lower bumps on the uneven paper surface. You end up with more pigment in the puddles of paint and it becomes difficult to get an even distribution of color. And by masking the flowers I’ll be free to work on the background without worrying about painting around the complex flower shapes. 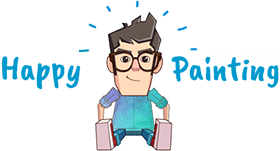 These are things that will make the painting process easier and more comfortable, but at the same time, help to produce better results. The colors in this painting are complementary. This kind of color relationship is often found in nature and it produces a harmonious and attractive appearance. Complementary colors are those which are opposite each other on the color wheel. Magnolias are white and pink, and the complement of pink is green. I’ll be painting the background using a wide variety of greens, which means the overall color scheme is what’s known as “complementary analogous”. Analogous colors are those which are close to each other on the color wheel. The range of blue-greens, greens, and yellow-greens in the background produce an analogous range of colors, while the pink blooms add a complementary hue. Hence the term complementary analogous. My first step was to transfer a sketch to the watercolor paper with a HB pencil. I do this first because I like to get the outlines right before I start any painting. And surprisingly, it doesn’t matter that you stretch the paper after the pencil drawing. The pencil lines won’t wash away during the wetting process of stretching the paper, which is pretty handy. To stretch watercolor paper you’ll need a flat board and some gummed tape to fix it down. I use a large enamel butchers tray to soak the paper. I’m using arches 140 lb / 300 gsm paper which I find needs soaking for 10 to 15 minutes (don’t soak the paper too long or the sizing will wash away and modify the papers handling characteristics). Test the paper by lifting a corner from time to time. When it starts to feel more like cloth than paper, then it’s ready. Cut your strips of gummed tape in advance. When the paper is sufficiently soaked, lay it flat on the board, making sure there are no air bubbles trapped under the surface. The glue on the gummed tape is activated by water, so I just dip them quickly in the water to make them sticky (not too long or the glue will wash off). Now tape down all the sides of the paper onto the board. ​I sometimes like to double up my tape and use thumbtacks to make sure the paper doesn’t budge when it contracts during the drying process. Occasionally the tape isn’t enough, and it’s a shame to go through the whole stretching procedure twice. Let the paper dry for at least 24 hours. Leave it on a flat surface if possible because it will dry more evenly. Since the magnolia flowers are quite big, I’m using two different masking methods. I’m using masking film (otherwise known as frisket) to protect the larger shapes of the flowers. Frisket is great for masking, simply because it does not lift or tear your watercolor paper. But I’ve found that you need to use it in a particular way with watercolors… (This is the frisket film I use - find it on Amazon). ​Some people tell you to stick the whole sheet of frisket onto the surface first, then use a sharp knife to cut around the shapes. You then lift off the unwanted film leaving just the protected shapes. I find this very awkward and time consuming. Also this method scores lines into your watercolor paper which will soak up paint and leave traces. Roughly cut out the masking film and stick it onto the watercolor paper. You should end up with a slight gap between the edge of the flowers and the masking film. Now you can finish the masking more accurately using masking liquid (I use Pebeo drawing gum because I like the blue tint which makes it easy to see). I think this method has a few advantages. ​You don’t get score lines in the paper. ​Frisket film doesn’t stick well to watercolor paper because of the rough surface. The masking fluid helps to seal the edges of the film. 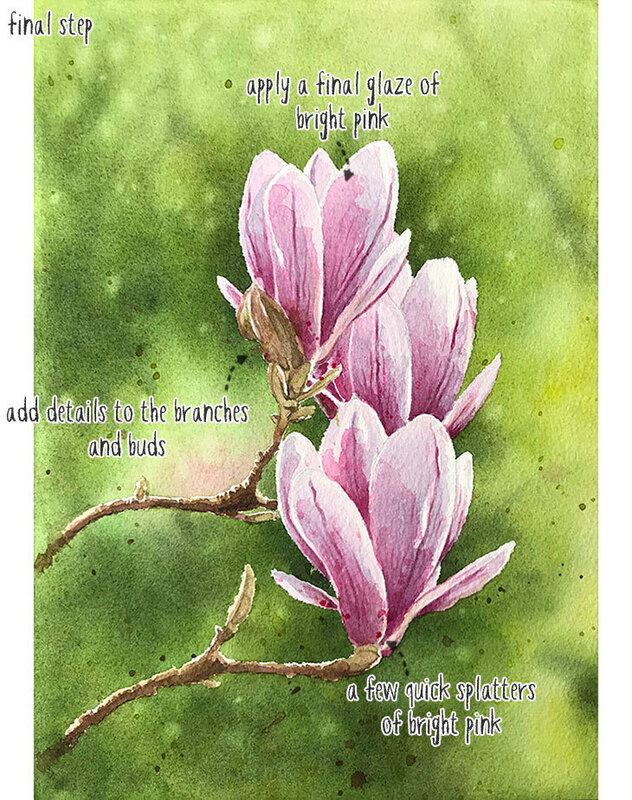 ​By combining film and liquid you don’t have to use up huge quantities of masking fluid, which would be tedious. 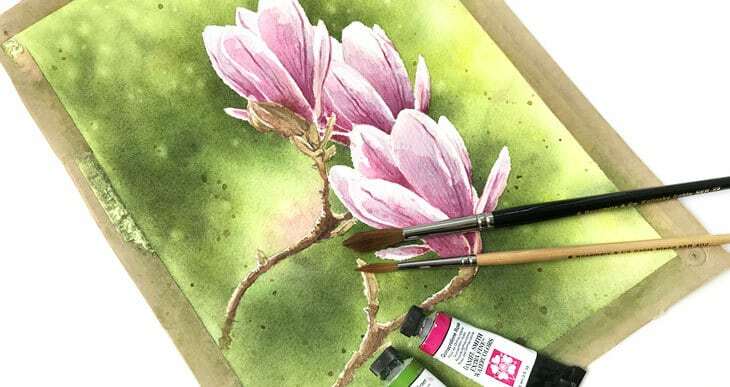 Now that your magnolia flowers are protected you can actually start painting… Phew! The idea is to build up the background in stages using a wet in wet technique. Start by wetting the whole of the paper surface so that it’s damp. I do this using a spray bottle and a wide flat brush. I find the spray bottle better for re-wetting the paper after each layer of paint, because it means you don’t repeatedly brush the underlying painting. Next I start to paint into the damp paper with various hues of green (I used mostly Lemon Yellow, Sap green, mixed with Burnt Umber to desaturate the colors. I also used a bit of Quinacridone Rose). You can use a diluted mixture of paint, since we’ll be adding more layers to build more intense colors. Once the whole background is painted I go back into the painting with a clean damp brush to lift off the paint in a few random places. I do this by brushing the paper with clear water, then soaking it up with a clean cloth. I’m effectively creating little dots of lighter color. The final objective it to give the impression of a blurred background with a few dots of dappled light, as if the sun were shining through the branches of some trees. Let the paint dry. Tired of waiting? Yep… Me too. I use a hairdryer to speed up the drying process. Continue the background in exactly the same way as the first pass. Rinse and repeat this operation until you’re happy with the background. You can see the stages that I went through in the example. As a final touch, I splashed a few dots of paint onto the dry background to add some texture and interest. In the next step I begin to paint the flowers, so it’s time to remove the masking. Use a kneadable eraser to help you remove the dried masking fluid. The flowers are painted using a glazing technique, which is a wet on dry method of painting. With glazing you apply layers of paint, one after the other, leaving each previous layer to dry before moving on to the next. This method is great for painting detail since your brushstrokes produce hard edged shapes. ​As you can see, you can adapt your technique according to what you want to achieve. In this case I wanted the background to be blurry and out of focus, but the main subject to be sharply detailed. Hence the use of wet in wet for the background and glazing for the flowers. For the first glaze of paint I used a mix of Quinacridone Rose with a very small amount of Phthalo Blue (GS). The mixture is a very diluted pink. Keep in mind that as you paint successive layers of color the hues will become more intense. This is a typical way of working in watercolor, painting from light to dark. Don’t forget to leave some white paper for the highlights. The second glaze is another layer of pink. Remember to let the underlying wash dry completely before you apply a new layer of paint (this is the essence of glazing). Don’t just paint over the same shapes, but try to add some form to the petals. Also keep in mind that magnolia flowers are whiter towards the tips. In the third glaze I started to add some detail to the petals. Magnolia flowers tend to have a pronounced vein along the middle, and smaller pink veins that start at the base. I just used quinacridone rose for this. The following glaze adds some shading with the aim of improving the curved form of the petals. I used a slightly more purple shade of pink for this (a little Prussian Blue mixed with Quinacridone Rose). When this was dry, I intensified the details of the pink veins with a strong pink color. In the final stage I added details to the branches and buds. I used a combination of Burnt Umber, Sap green, and some Payne’s Gray. I also strengthened the shading on one side of the petals. I didn’t want the shaded parts to become too dull, so rather than using gray, I used a mid-strength mix of Quinacridone Rose. And to complete the painting I used the same mix to splash a few random spots on the flowers. Happy? Great… Now you can give your painting to your mum. She’ll love it! Thanks George – come back any time ! Hi Beatrice – So happy to know you were able to do the painting! I love how you explain the process in detail. Would love to see more of this tutorial. Also, video perhaps to accompany in the future? Thank you! Hi Su – glad you enjoyed the tutorial… more good things to come!